Allison Cook’s reputation as one of today’s foremost exponents of contemporary and 20th century repertoire has been firmly established through the recent creation of a range of formidable characters including Marie in Wozzeck, the Duchess of Argyll in Powder her Face, Judith in Bluebeard’s Castle, Schoenberg’s Erwartung, and Kaija Saariaho’s Emilie. This season opens with Cook’s most anticipated role debut to date, as Richard Strauss’ Salome in a new production by acclaimed director Adena Jacobs for English National Opera, conducted by Martyn Brabbins. 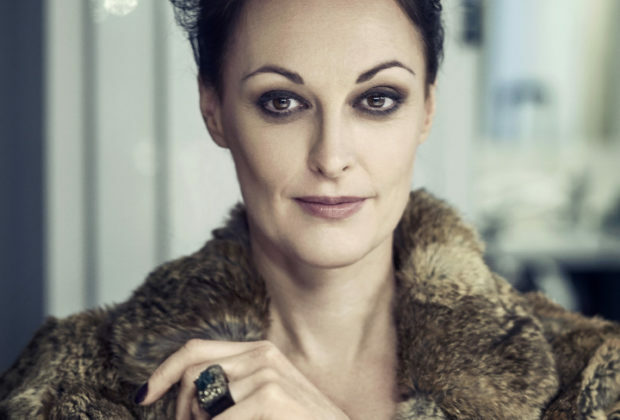 Subsequently, she will join Josep Pons for the world-premiere of Casablancas’ Enigma De Lea for Gran Teatre del Liceu before going on to Theater Dortmund as the Marquise de Merteuil in the German premiere of Luca Francesconi’s Quartett. This role in particular has earned Allison unanimous acclaim from the first performances at Teatro alla Scala to subsequent appearances at Gran Teatre del Liceu, Théâtre Royal de la Monnaie, Teatr Wielki, Teatro Colón, Buenos Aires, as well as at Wiener Festwochen, La Cité de la Musique, and the Holland and Strasbourg Festivals. Elsewhere Allison sings Judith for Teatro Nacional de Sao Carlos, returns to Joe Hill Gibbins’ acclaimed production of Greek for Scottish Opera in guest performances at the Brooklyn Academy of Arts, and further expands her concert repertoire in Pierrot Lunaire with Ensemble Signal at the Library of Congress, Washington and in Berio’s Folk Songs with the Bilkent Symphony Orchestra. As an artist of unusual versatility and vocal range, Cook has been hailed for her interpretation of the Duchess in Thomas Adès’ Powder Her Face which has found a special place in her repertoire after tour de force performances in New York, Québec, Warsaw and Brussels and she was praised as “downright phenomenal” in Kaija Saariaho’s monodrama Émilie at the Salzburger Landestheater. In Gerald Barry’s Alice’s Adventures Underground, she joined the Britten Sinfonia and conductor Thomas Adès at the Barbican, London and Walt Disney Concert Hall, Los Angeles and sang her first Erwartung at the Bergen International Festival in a new production by Netia Jones. Other recent highlights include Miss Jessel in Kasper Holten’s The Turn of the Screw for Teatro alla Scala conducted by Christoph Eschenbach, Judith in Mariusz Treliński’s pivotal production of Bluebeard’s Castle for Teatr Wielki, and Allison’s debut last season with the Berliner Philharmoniker in The Diary of One Who Disappeared. At the Royal Opera House, Covent Garden, Cook has appeared in Wozzeck, Turnage’s Anna Nicole and, most recently, in Krzysztof Warlikowski’s new production of Janáček’s From the House of the Dead.